Old Faithful Geyser, the most famous geyser in the world, was named by the Washburn expedition in 1870. It is located in the Upper Geyser Basin, and is so notable that an entire area of the park along with a lodge and an inn are named for it. 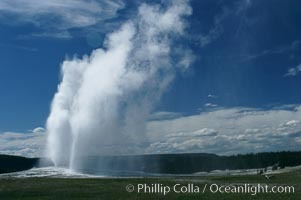 While it is neither the largest nor the most predictable geyser in the park, it is by far the most-viewed geyser due to its accessibilty, beauty and its predictability. Within minutes after an eruption ends, park rangers predict the time of the next eruption and claim to be accurate (within 10 minutes) over 90% of the time. (The interval between eruptions is predicted based on the duration of the previous eruption, so only the next eruption can be predicted.) It can reach heights of 180 feet or more, and an eruption can last up to five minutes and release over 10,000 gallons of water. Its behaviour has not changed significantly during the entire recorded history of Yellowstone National Park, although earthquakes have lengthened the interval over the years.